All "Stormrider" monsters on the field gain 300 ATK. 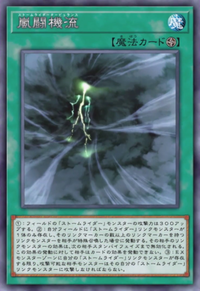 While you control exactly 1 "Stormrider" Link Monster, if your opponent Special Summons a Link Monster(s) whose Link Rating is equal or higher: Negate that opponent's Link Monster's effects until your opponent's next Standby Phase. Your opponent cannot activate cards or effects in response to this effect's activation. While you control a "Stormrider" Link Monster in the Extra Monster Zone, your opponent's monsters must attack it, if able. This page was last edited on 6 February 2019, at 18:31.